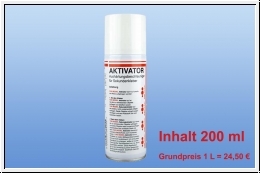 Activator in spray form for the acceleration and curing of cyanoacrylate adhesives. Because of the activator spray hardens too thick superglue from lightning. Also superglue is so used, and also fills gaps in the thicker layers.